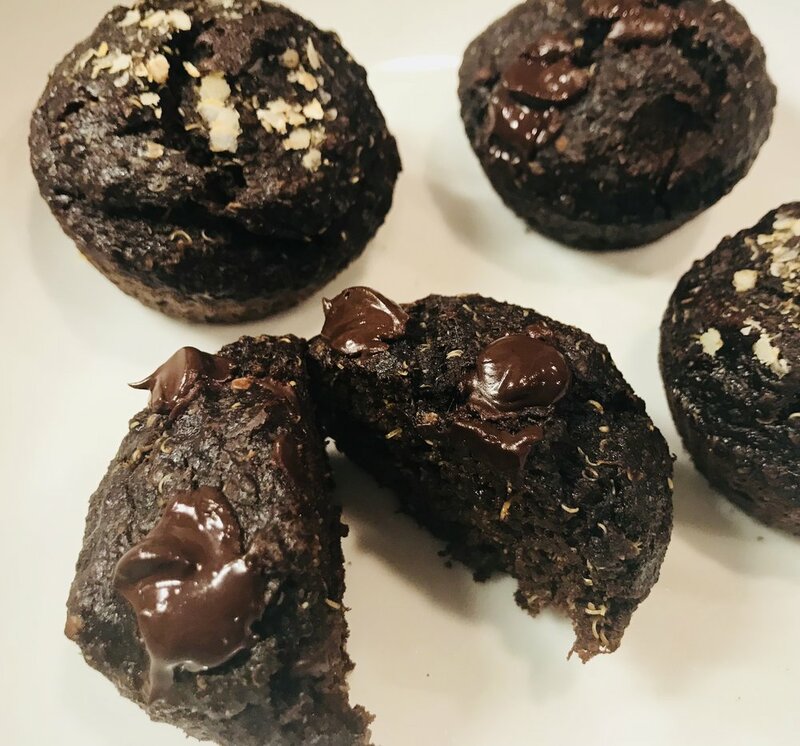 These decadent dark chocolate chip muffins are so rich and delicious you’ll never guess they’re good for you too! Made with quinoa flakes so they’re gluten-free, high in plant-based protein and full of fiber. They’re also dairy and nut-free making them perfect for a nut-free school snack. Store in the refrigerator or freezer, and pop in the toaster to warm up for breakfast or a healthy treat anytime! In a large bowl combine mashed bananas, egg, coconut oil and milk. Stir until well combined. Add quinoa flakes, cacao powder, baking soda, baking powder, sea salt and coconut sugar. Stir until batter forms. Spoon batter into prepared muffin tray. Top each muffin with a few chocolate chips or sprinkle with extra quinoa flakes. Bake for 10-12 minutes. To check if done, stick a toothpick into a muffin and if it comes out clean with small crumbly bits then it’s ready. Top of the muffins should be firm to the touch too. Store in the refrigerator or freezer and pop in the toaster to warm up for a delicious breakfast or anytime healthy snack! In a small saucepan over low-med heat melt the coconut oil or ghee and then allow it to cool for a few minutes. Meanwhile in a medium bowl mix the almond flour, baking soda, baking powder, sea salt and cinnamon. In another bowl, combine the eggs, honey, vanilla and melted coconut oil or ghee. Pour wet ingredients into the dry and mix well. Stir the blueberries into the mixture. Spoon batter into muffin tins or silicon cups and bake for 25-30 min. Edges should be just turning brown and firm to the touch. Store in the refrigerator or freezer and pop in the toaster to warm up for a delicious and healthy breakfast or anytime snack! These granola bars are packed with healthy ingredients, taste delicious and are beyond easy to make! They are naturally sweetened with banana and applesauce and contain healthy fats from the seeds. Perfect for breakfast, a post-workout snack, or a yummy dessert - you and your family will love them! Preheat oven to 350 degrees. Line a 9 x 13 inch baking sheet with parchment paper. In a medium bowl mash the bananas and stir in the applesauce until well combined. In a separate bowl mix all the dry ingredients. Stir into the banana mixture until well combined. Transfer to the prepared baking dish and press down evenly. Bake until bars and golden and are starting to separate from the sides of the pan, about 30-35 minutes. Let cool for 15 minutes then cut into bars. Store in an airtight container in the fridge. These muffins are my family’s favorites! They are simply delicious and super satisfying while being gluten-free, dairy-free, and sugar-free. My son and husband love theirs for breakfast while my daughter will have hers for dessert, or as an after-school snack. Use Coconut Oil to lightly grease muffin tins or use muffin liners. If you have silicon baking cups you can skip this step. In large mixing bowl, whisk together almond flour or meal, Psyllium Husk, Baking Soda and Sea Salt. Add the 3 tablespoons of Chia Seeds to 1 cup of warm water - let seep for a few minutes. In small saucepan over low-med heat melt Coconut Oil. In another bowl beat the eggs. Whisk in Coconut Oil, Maple Syrup, Vanilla and Chia Seed mixture. Stir in the mashed Banana, chopped Dates and Blueberries. Add Walnuts or other nut if you like. Slowly pour wet ingredients into the dry and mix well. Spoon batter into the muffin tins and sprinkle with Chia Seeds. Bake for 30-35 min, until slightly browned on top and a toothpick inserted in center comes out clean. Let cool completely in pan on wire rack. Tip to remove muffins from tin: gently run a paring knife around the edge of each cup.